Big ideas start with small changes. This is definitely the case for the 11 outstanding projects that were just honored for their design excellence in small project design as the American Institute of Architects (AIA) just announced its 2018 Small Project Awards winners. The awards are given in three categories: architectural objects or environmental art that cost up to 150,000 in construction (Category 1), small project constructions that cost up to 1,500,000 in construction (Category 2), and projects under 5,000 square feet (Category 3). The theme this year is “Renewal.” Here are a few of the Small Projects award winners: Howeler + Yoon Architecture designed Shadow Play, a hovering canopy formed from triangulated modules. 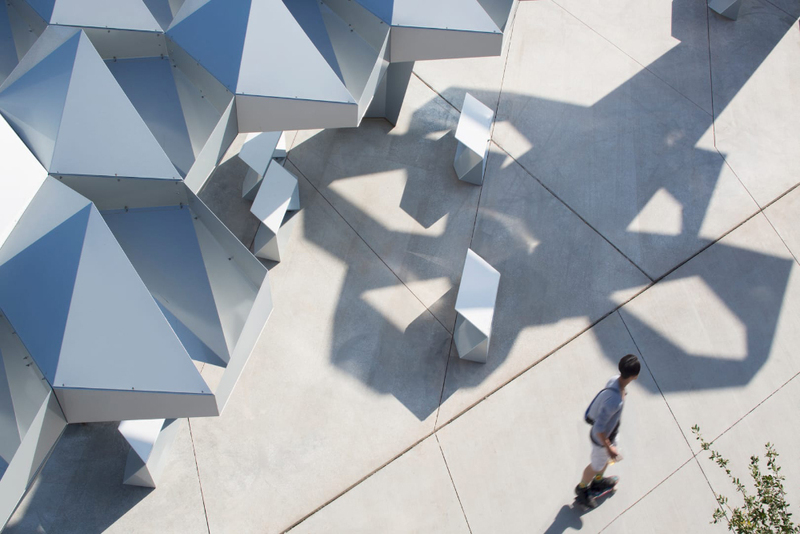 Located in downtown Phoenix, Arizona, Shadow Play is a cluster of shade structures that casts geometric shadows that transform the streetscape and how pedestrians congregate in the public space. The canopy’s design maximizes the shaded area but also allows for apertures that bring breezes underneath, making it an ideal space to sit and relax. substance architecture designed the Principal Riverwalk Pump Station in Iowa, which also received the award. The design includes two objects–a Pump House that responds to the neighboring Café Pavilion with similar materials of black zinc and steel, and a Gate Valve Platform that combines translucent glass atop and a solid concrete base. According to the AIA, “The creation of this facility has literally led to the renewal of Des Moines' Historic District and, in concert with the Café Pavilion, it frames a popular public space along the river.“ Kevin Daly Architects was recognized for a low-cost, low-impact prototype backyard home. The 500 square foot parcel dubbed BI(h)OME has an innovative facade made of a paper honeycomb inside layers of ETFE, making a lightweight but sturdy structure that creates a pleasing aesthetic. The prototype is recyclable and customizable, and aims to serve as a housing option for 500,000 single families in Los Angeles, a city that struggles with a “shelter crisis.” Sawmill, designed by Olson Kundig, is a family retreat standing in the high desert of California. In response to the harsh climate and the remote location, the net-zero home utilizes recycled but durable materials and employs strategies to reduce environmental impact and minimize operating costs. Cutler Anderson Architects’ design of Studio / Bunkhouse blends in with the wooded site in Washington. The 80 square feet compact, multi-purpose toolbox is set at the top of a waterfront bluff and complemented by the jury for the ability to work with limited power-tools within the challenging site. Other winners include Allford Hall Monaghan Morris for The Grand Lake Poolhouse, FXCollaborative for their Chapel at Congregation Kehilath Jeshurun, and Edward Ogosta Architecture’s design of Rear Window House. For the past 15 years, the AIA Small Project Awards program sets out to promote value and design quality in buildings, no matter their size. The complete list of the awarded projects can be seen in the link. The University of California, Santa Barbara’s (UCSB) new San Joaquin Villages by Lorcan O’Herlihy Architects (LOHA), Skidmore, Owings, & Merrill (SOM), and Kevin Daly Architects (KDA) opened to student residents during the fall 2017 semester. The expansive project brings over 1,000 student beds and a string of campus amenities clustered around open courtyards to the housing-starved university’s North Campus. The village master plan was created by SOM, which also completed the new Tenaya Towers—a pair of six-story housing blocks—to create 65 new, three-bedroom, two-bath apartments. For the project, SOM designed a pair of parallel towers that are oriented east-to-west that are studded with projecting balconies to help maintain passive airflow and enrich student life. SOM also added a new freestanding pavilion to a plaza located between the two towers that will contain study spaces and a recreation room. In addition, the towers are outfitted with rooftop terraces overlooking the public spaces below. The project also includes a new dinning commons by architects KieranTimberlake. The project site was reworked by landscape architect Tom Leader and Sherwood Design Engineers—which provided civil engineering and site design—to redirect stormwater runoff into new biofiltration planters and bioswales that will purify the captured water before draining it into adjacent wetlands. The adjacent North Village site is carved up into four principal parcels, with LOHA and KDA each taking two sites to create a patchwork of low-rise, interconnected housing blocks. The intentionally utilitarian accommodations are linked by acrobatic exterior circulation and shared student amenity spaces, like a handsome laundromat outfitted with operable awning windows and a spare, wood fin-clad organic market. Together, these areas bring 107 three-bedroom, two-bath apartments to UCSB. 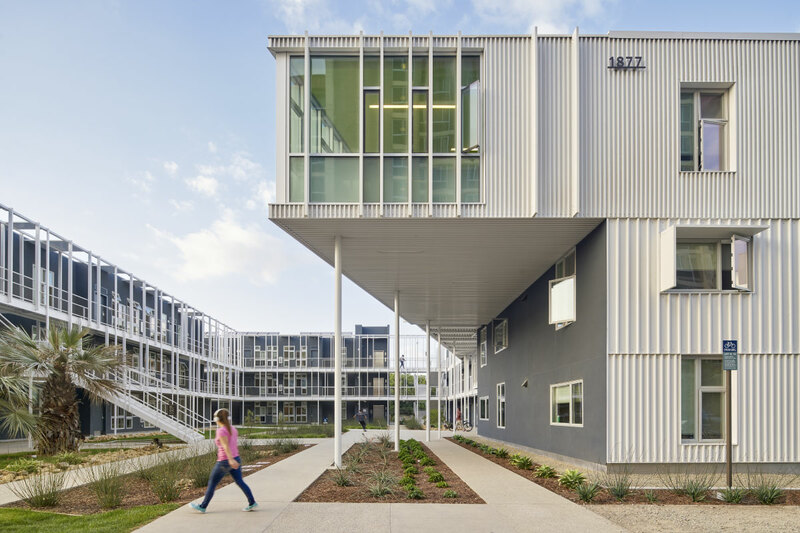 Lorcan O’Herlihy, principal at LOHA, said, “UCSB dormitories have typically pushed circulation to their exterior envelope, with an inert central courtyard accessible only from within the building. [Our] design inverts this circulation scheme, [creating] a reductive exterior edge with an open, lively interior courtyard containing all building circulation, encouraging movement throughout the complex.” The grouped structures are made up of shifting, canted geometries and are clad alternately in corrugated metal panels, wood fins, and stucco along the exterior, campus-facing areas. The LOHA-designed blocks feature painted plaster walls along the courtyard exposures. Social hubs—including reading rooms, social spaces, and dining facilities—float around the complex, projecting from second-floor perches in some instances, tucked snugly below elevated walkways in others. The units themselves are designed with passive ventilation in mind, and windows are wrapped in both vertical and shaped aluminum sunshades, depending on the orientation and structure. Overall, the multifaceted project updates campus housing, deeply embedding shared social experiences into campus life through simple ornamentation and permeability. Kevin Daly Architects recently completed an addition to UCLA’s Herb Alpert School of Music that sets a new framework for the school’s future growth and presents a new face for the music building. The Evelyn and Mo Ostin Music Center is the second addition to the 1950s structure that was previously augmented in the 1980s. Sited within UCLA’s campus of over 200 buildings, the project was regulated by campus design standards that define a material palette consisting of a “UCLA blend brick,” along with buff stone, terra-cotta, and concrete. According to UCLA’s Physical Design Framework, these are “enduring materials that express a quality of permanence and durability.” The standards reference the first four buildings constructed on campus nearly 100 years ago, in a red brick romanesque revival style. 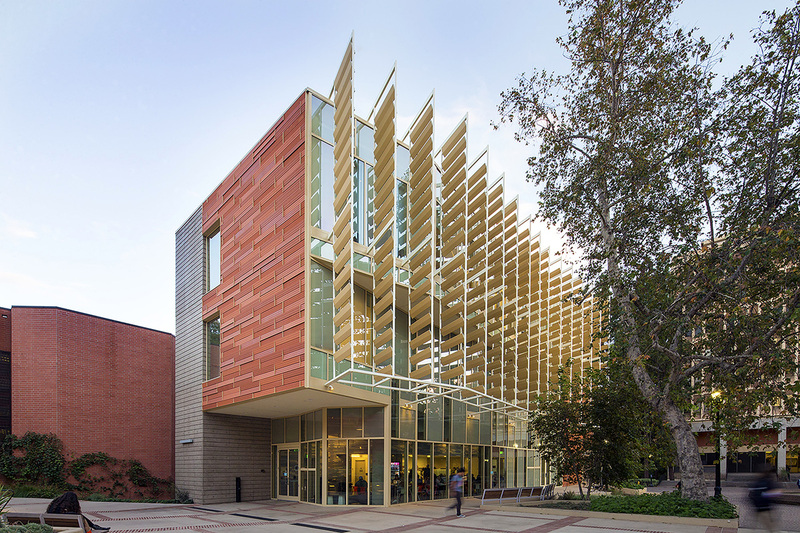 A terra-cotta rainscreen system was ultimately specified for its performative qualities, which helped the building achieve UCLA’s required energy standards – a significant 20% better than state energy codes. Open joints in the finish material promote natural ventilation and solar shading. This assembly provides higher R-values throughout the exterior facade by allowing for a continuous layer of insulation, and helps to eliminate air infiltration. The cladding system also allowed for a relatively standard CMU exterior wall construction. KDA collaborated across the country with East Coast-based terra-cotta manufacturer Shildan to produce the custom facade material. Kevin Daly, founder of KDA, described this design process as a “collaboration to get [a] contemporary material to fit within a historic campus.” Bricks from UCLA’s campus were sent to the Mount Laurel, New Jersey company who color matched them to their standard color palette. Daly said their desire for this project to produce a more natural effect pushed Shildan to do something slightly different than what they normally do: "In a lot of the industry, the focus is to produce super consistent results, so that by the time you wrap the building with material, the end matches where you began. We wanted to do something different. We wanted to introduce a slight variation that was consistent enough to look like it was all from one palette, but at the same time was not a factory-produced tightly controlled material." In response, Shildan developed a custom fabrication process that produced this variation. Six tile styles were created with various glazing and firing techniques on two standard color finishes. The panels, made from 35% recycled content, were selectively left in the firing process longer than typical, while others were fired under slightly different temperatures, introducing variation to the material qualities of the panels. A number of mockups developed some basic ground rules for the design team based on campus guidelines. KDA worked with available terra-cotta samples to demonstrate their idea before developing the mockups into full-scale test systems. The desire to produce variation in terra-cotta is not unique, but the methods employed at Ostin are notable. At Lawrence Public Library, Gould Evans introduced variation to their facade by designing a combination of grooved and smooth panels, specifically controlling the panel texture. At UCLA, KDA’s facade produced variation through the materials manufacturing process and by a panel rotation, casting shadows over the facade for an additional natural layer of perceived color variation. Focusing on the contextual specificity of their project within the historic campus setting, KDA introduced an additional level of detail to the facade. Grooves etched into the terra-cotta panel register course lines found in standard brick on campus. A louvered screen at Knusten Hall, which faces the music center from across a public plaza, provided the basis for a significant sunshading system marking the west facing main entrance. Fixed in place diamond-shaped terra-cotta baguettes framed off a secondary steel structure spring from an expansive curtainwall. The system is saturated in UCLA’s classic “buff” limestone color. The curtainwall system features what Daly calls a “transparent shading system,” integrating an extruded polycarbonate honeycomb material into the insulated glass layers to provide an extra layer of solar protection. At the corners of the faceted building, a reverse mitered edge trim out of painted aluminum protects the open end of the terra-cotta panels, while “fins” set proud of the undulating facade surface help articulate the texture of the facade by casting shadows registering the varied angles of the panels onto the building. The interior acoustical spaces provide a unique cladding design that was driven by economy and the desire to create a dynamic environment. KDA worked with Newson Brown Acoustics to develop a design that utilizes three repetitively cut douglas fir and spruce shapes. These panels were re-assembled into layers to produce a complex surface patterning which was flexible enough to expand or contract the quantity of exposed absorptive acoustical material. Opening August 20, Shelter: Rethinking How We Live in Los Angeles, the inaugural exhibition at the A+D Museum's new Arts District space presents works by architects and designers that challenge and improve upon L.A. housing typologies. 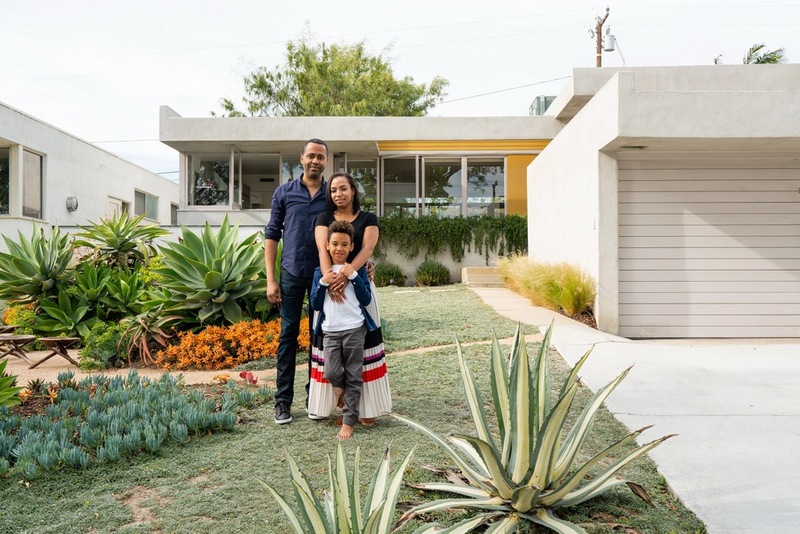 The single-family house has long been the touchstone for experimental architecture in Los Angeles, from the Case Study Houses to Gehry’s own home in Santa Monica, replete with (now-removed) domesticated chain-link fencing. But as the cost of real estate puts pressure on residential architecture, new solutions for single- and multi-family housing are desperately needed. Curators Sam Lubell and Danielle Rago invited local practices to develop proposals for the Wilshire Corridor and along the Los Angeles River, these include Bureau Spectacular, LA Más, Lorcan O’Herlihy Architects, MAD Architects, PAR, and wHY Architecture. (Editor's Note: Both Lubell and Rago are regular contributors to AN, and Lubell is AN's former West Coast editor.) Works by Kevin Daly Architects, Michael Maltzan Architects, Bestor Architecture, OMA, R&A, and Koning Eizenberg, will also be on view. AN spoke with the curators. The title is Shelter, the absolute basis for architecture, but what does it mean to “rethink how we live” and why is this reassessment so pressing right now? Sam Lubell: LA is going through monumental changes, re-embracing density, transit, and the public realm while facing unprecedented challenges around affordability, the environment, and congestion. But while the city has always been a center for residential innovation, most residential architecture here today does not properly respond to the changes taking place. We're hoping to help spur a dialogue about reshaping our housing and our lifestyles to today's realities. It’s a great line up of practices in the show. What were your criteria for selecting participants? 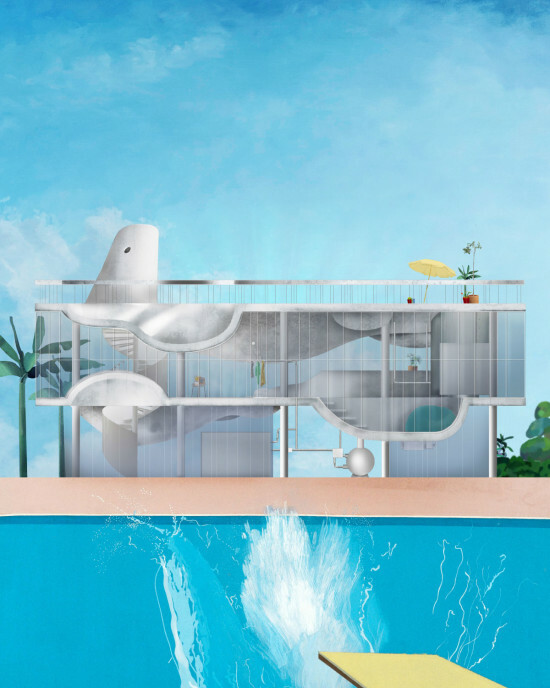 Danielle Rago: The show features [six new proposals] by Los Angeles design practices—each occupies a different position in the field of architecture. Yet, we believe all approach residential design in interesting and innovative ways. SL: We also wanted a mix of emerging and established firms, and practice-oriented and research-oriented firms. We think it's a great mix, full of energy, creativity, and some surprise. How did the designers address some of Los Angeles’ hot button topics: density, affordability, accessibility, and sustainability? SL: The designers have done an excellent job addressing several of these issues. wHY, for instance, tackled both density and affordability by proposing new configurations of development in underused, residual public spaces along Wilshire Boulevard. LOHA tackled environmental issues by creating homes that utilize the aquifers near the L.A. River to capture and store water. And MAD has created a new type of outdoor living within a dense cluster of interconnected, extensively landscaped towers. DR: The invited teams all investigated one if not more of these pressing issues currently affecting Angelenos. LA Más' design addressed density and affordability by reconsidering the granny flat as a new model for low-rise high-density development in Elysian Valley along the L.A. River. PAR responded to increasing density and new transit offerings on the Wilshire Corridor with their proposal for a courtyard housing tower, where each unit maintains a visual connection to nature. And Bureau Spectacular investigated environmental challenges through the study and re-application of vernacular domestic architecture in L.A.
What's in a name? It seems that every time we get used to an architect's name they go ahead and change it. We're still confused by the name Ennead Architects (formerly Polshek Partnership), and we can't get our heads around monikers like Rogers Stirk Harbour (formerly Richard Rogers Partnership) and Populous (formerly HOK Sport). Not to mention the headaches when firms like AECOM swallow the likes of Ellerbe Becket and EDAW. The latest on the new name train are some of LA's brightest firms. Daly Genik Architects is now Kevin Daly Architects. And wHY Architecture is now why design. The former came as a result of shuffled leadership—partners Kevin Daly and Chris Genik parted ways amicably. 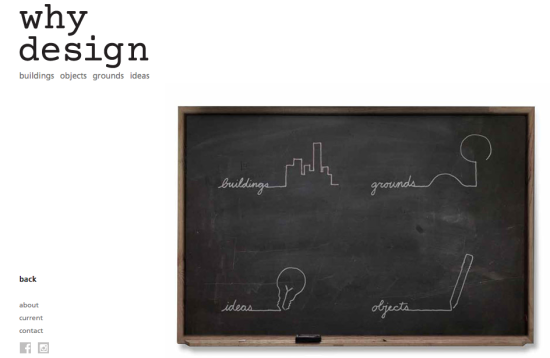 The latter is a branding change to broaden the firm's scope beyond architecture. Both have completely new web sites. And both, no doubt, will puzzle us all until we finally come to terms with the inevitability of change.